This file photo shows North Koreans farmers, seen from the window of a train, as they work in the fields along the railway line between Pyongyang and the North Phyongan Province on the west coast, in April. A long and widespread drought has ravaged one of North Korea's breadbasket provinces, state media say, sparking fears of worsening food shortages in the impoverished communist state. SEOUL (Reuters) - North Korea's rivers, streams and reservoirs are running dry in a prolonged drought, state media said on Monday, prompting the isolated country to mobilize some of its million-strong army to try to protect precious crops. The drought is the worst in North Korea for over a decade, state media reports have said, with some areas experiencing low rainfall levels since 1961. 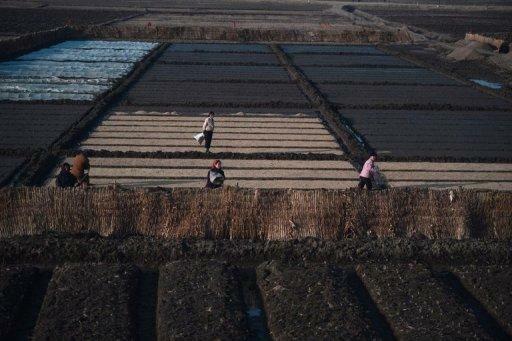 Office workers, farmers and women have been mobilized to direct water into the dry floors of fields and rice paddies, the official KCNA news agency said. In the 1990s, food shortages led to a devastating famine which killed an estimated million people but gave rise to a fledgling black market that in some areas now provides the food the government can no longer supply. Linda Lewis, of the American Friends Service Committee, a Quaker-led NGO, confirmed the media reports and said managers on its North Korean partner farms had seen lower-than-usual rainfall levels in March and May. "They expressed concern about 'serious drought' conditions and the impact this was having on spring ploughing and paddy field preparation," Lewis told Reuters via email. In some areas, she said, farm managers had experienced 70 days without rain. Higher-than average temperatures have exacerbated damage, affecting wheat, barley and maize, state media said. North Korea has previously blamed drought and floods for chronic food shortages which observers say are the result of bad planning and a highly centralized economy.